Do you have businesses in your community that show proper respect for Sunday, The Lord's Day, by closing their doors on that day? If you do, you need to say "thank you" to these great businesses for observing Sunday as a day of rest, family and worship. 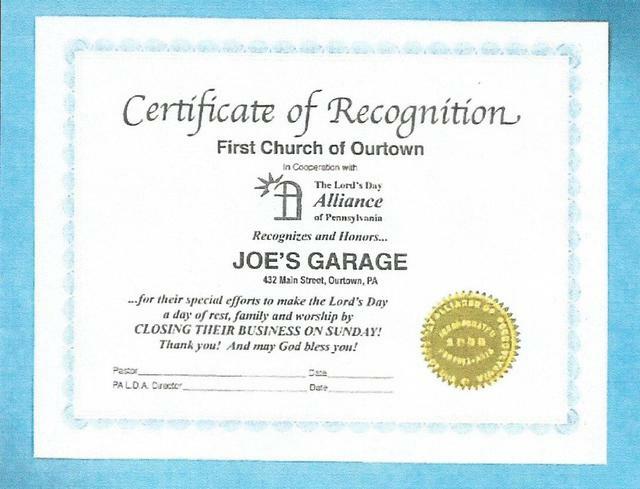 To help you thank these businesses, the Lord's Day Alliance of Pennsylvania now has available customized certificates that your church can present to these businesses...and the certificates are completely FREE! To create the certificates for you, we need the business name and address, and your church name and address. Remember, the certificates are FREE and there is no limit to the number of certificates that you can receive. To order, call 1-800-358-2303 or send your information to: L.D.A. of PA, 5915 Fox Street, Harrisburg, PA 17112. Are you looking for a way to remind the members of your church and Sunday school about the importance of Sunday, The Lord's Day? 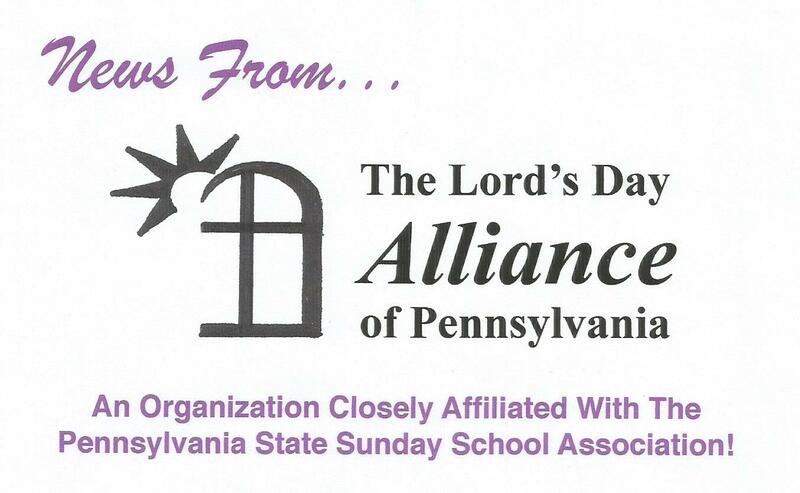 If so, we invite you to use the FREE bookmarks and tracts that are available from the Lord's Day Alliance of Pennsylvania. The bookmarks are 2" x 8-12" in size and are printed of parchment-look card stock. They contain the "Lord, Thank You For Sunday" poem. There are also two different FREE tracts available. 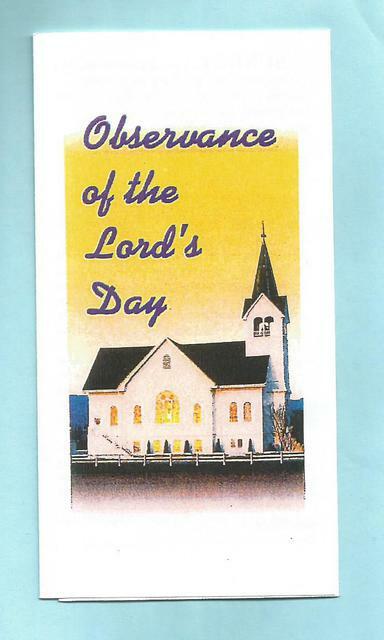 The first tract is entitled "Observance of the Lord's Day" and tells why Sunday is a special day and why all Christians should observe the day. The second tract is entitled "What Will Your Children Be Learning This Sunday Morning?" 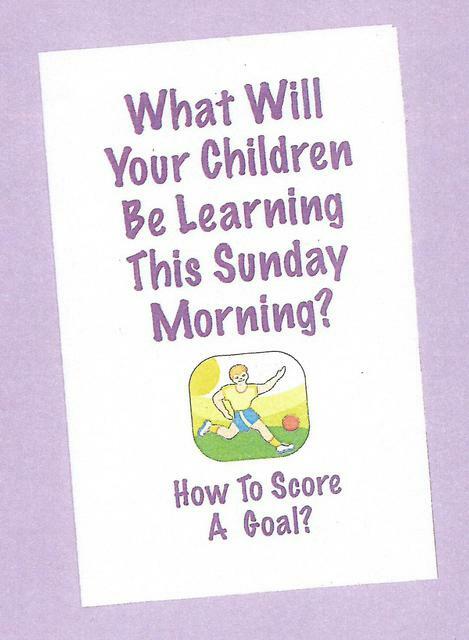 This tract is designed to tell kids...and their parents...why children should be in church and Sunday school rather than playing sports on Sunday morning. To order as many of these tracts or bookmarks as you can use in your church and Sunday school, contact the L.D.A. of PA, 5915 Fox Street, Harrisburg, PA 17112. Phone 1-800-358-2303. If you call and get an answer machine, be sure to tell us which tracts or bookmark you would like, how many you would like to receive and the mailing address to which the items should be sent.